MB3 completes your final wipe. Make toilet paper more hygienic with this soothing cleansing lotion. MB3 is a soothing external perianal cleansing lotion designed to achieve that “bidet fresh” feeling on the go. 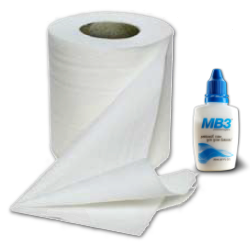 When applied to toilet paper for the final wipe, MB3 will leave you clean, comfortable, and confident.Formulated to improve your personal hygiene without the use of harsh irritating chemicals, MB3 won’t dissolve toilet paper on contact and glides easily on the skin. At the office, ballpark, movie theatre, camping and/or outdoors… whenever nature calls… MB3 will be your most trusted ally and your new best friend. Personal care for your derriere®. Don’t leave home without it. See our Perianal Cleansing Lotion product review on Poopreport here.